Both raw and cooked vegetables are better for health. Vegetables contain low amounts of fat and calories. Vegetables are good source of dietary fiber. Vegetable have soluble fibers such as pectin, psylium and gum dissolved in water. Vegetable help maintain healthy body and protect from the risk of diseases. Some raw vegetable provide more nutrients and some vegetable provide more nutrients when cooked. Asparagus, tomatoes, spinach, mushrooms, pumpkin and carrots are better to eat when cooked. Beetroot, broccoli, onions, red peppers, cabbage and cauliflower are better for intake in raw form. 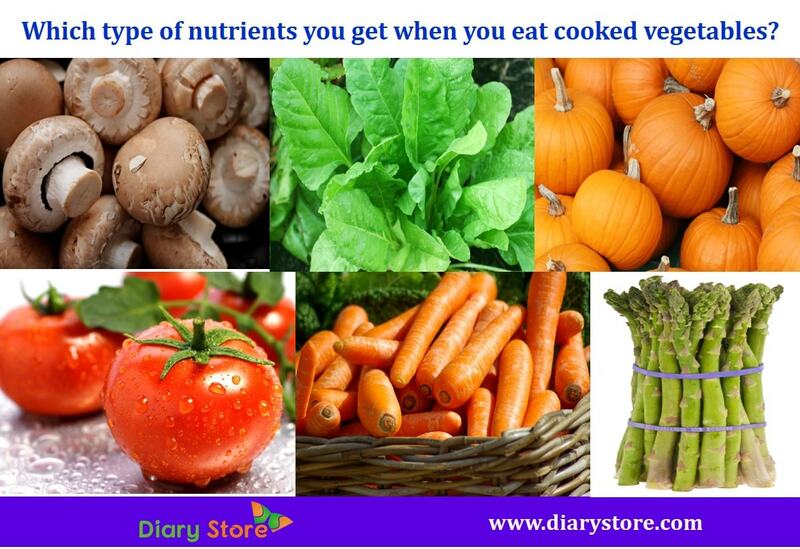 Cooked vegetable are much easier to digest and absorb nutrients. Certain raw vegetable to provide considerable nutrients and minerals. Raw vegetable provide vitamin C and vitamin B while cooked vegetables cannot convey vitamin C to our body in sufficient quantities. However, cooked vegetable provides beta-carotene oxidants. 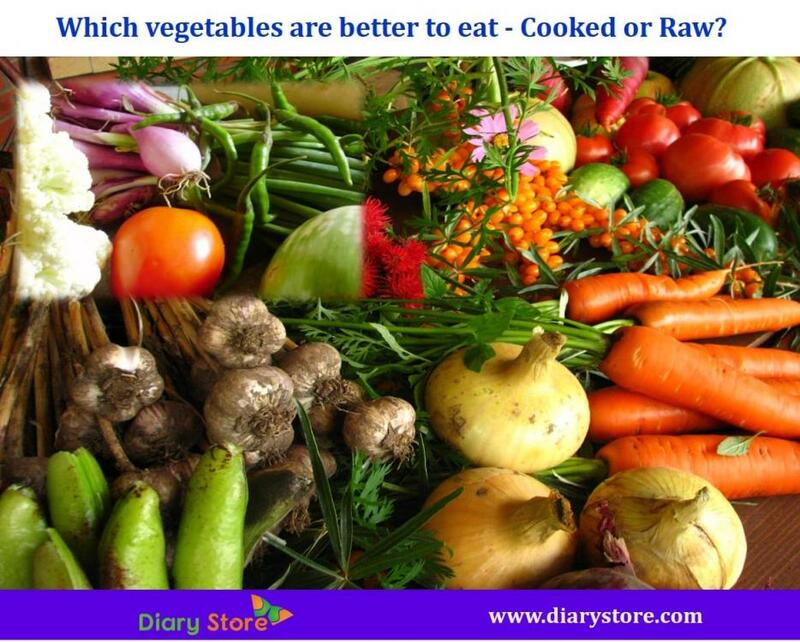 Both cooked and raw vegetable give separate health benefits. Which Type of Nutrients You Get When You Eat Cooked Vegetables? Cooked vegetable provide vitamins and minerals. Some cooked vegetables release antioxidants and fight against cancer and heart diseases. Cooked vegetable kill harmful bacteria and also decrease the ant-nutrients while some cooked vegetable like tomatoes, carrots, spinach, asparagus and mushrooms supply more vitamins than in raw form. Cooked tomatoes release more lycopene. They break down cell walls for releasing lycopene. A high intake of lycopene reduces cancer and the risk of heart diseases. Carrots contain higher amount of beta-carotene and vitamin C than raw carrots. Beta-carotene belongs to a group of antioxidant substances called carotenoids. Body converts Beta-Carotene into vitamin A. It helps keep your vision, skin and the heart pretty healthy, supports bone growth and regulates the immune system. Cooked mushrooms have higher amount of zinc, niacin, potassium and vitamin B. Mushrooms are indigestible without being cooked. Mushrooms are considered as nutritive food and also for medicinal value.Cooked mushroom help in enhancing the immune system. Cooked Asparagus provides Vitamin C, A, E, folate and ferulic acid. Though raw asparagus is more delicious, but in cooked form it provides more vitamins. Cooked Spinach has high amount of fiber, calcium, thiamin, vitamin E and A, zinc and iron also contain beta-carotene, lutein and zeaxanthin. Spinach keeps heart healthy and maintains lower blood pressure, brain function and mental clarity. Cooked pumpkin has beta-carotene, potassium and vitamins. Pumpkin prevents degenerative damage to the eyes, maintains blood pressure and prevents cancer and heart diseases. 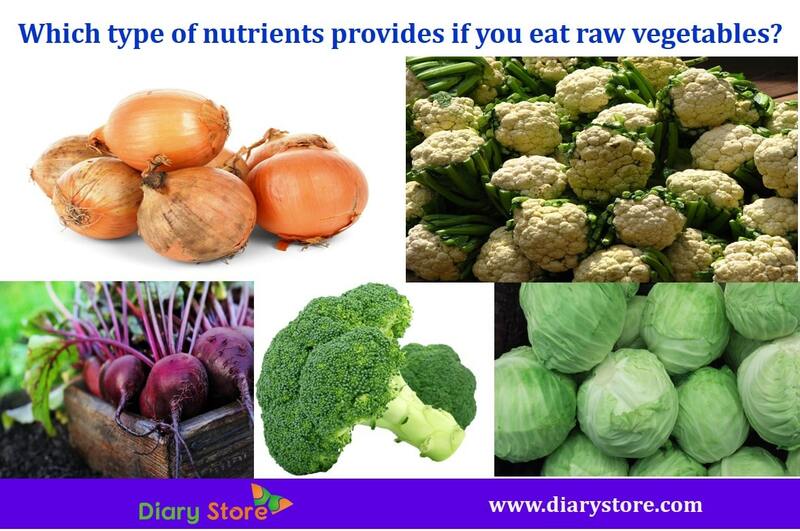 Which Type of Nutrients Provides if You Eat Raw Vegetables? Raw vegetables provide more vitamin C, biotin, thiamin, riboflavin and niacin vitamins than cooked vegetable. Some vegetable like beetroot, broccoli, onion, cabbage and cauliflower are best eaten raw than cooked for upkeep of good health. Beetroot is a good source of folate, potassium, manganese and magnesium. It is best when eaten raw as there is a loss 25% of folate and nitrate from food when beetroot is eaten in cooked form. They help maintain blood pressure, boost physical stamina, fight inflammation and augment anti–cancer properties. Raw Broccoli absorbs sulforaphane and supplies more nutrients faster in higher amounts than the cooked variety. Broccoli prevents cancer, cholesterol reduction, detoxification and maintains eye and heart healthy. Both cooked and raw onions are good for health. But raw onions have higher levels of organic sulphur compounds. Onions contains fiber, vitamin B and folic acid that help the body produce new healthy cells. Onions help to prevent diabetes, promote healthy skin and immune system. Cabbage contains manganese, potassium, folate, vitamin B1, magnesium, selenium and calcium. Raw cabbage gives more health benefits than cooked cabbage. Raw cabbage offers phytochemicals; it helps to maintain blood pressure, relieve headaches and helps to detoxify the body. Cauliflower is a good source of dietary fiber, manganese, omega-3 fatty acids and phosphorus. Raw Cauliflower is best to be eaten than while it is in the cooked form. It boosts heart health, fights against cancer, maintains brain health and has digestive benefits.